Thousands of hopeful Haitians await the issuance of their blue and silver embossed passports, to be granted to them by the Republic of Haiti. They have waited for two years to hear from President Michel Martelly that, while their passports are now ready, they have not yet been made available. So, it is with bated breath, vexation and anxiety that the applicants wait to hear how this extensive delay will affect their fees applicable. According to the Director General of the immigration and emigration service, Claude Raymond Junior, what they await is the go-ahead from the Martelly Government, allowing them to begin issuing the passports. The rub lies in the fact that, these passports, valid for a decade of travel use, were applied for before the passage of the 2012-2013 Finance Bill, which shows the cost being $10,000 gourdes. The raise is justified by the possible gain to the state's coffers of $150 million gourdes, a goal which will also be much aided by the raise from $1,600 gourdes to $3,500 for all 5 year passports. Before the new bill is ratified, amendments may be made to the draft, and many are hoping this will be so in regards to the proposed new fees. 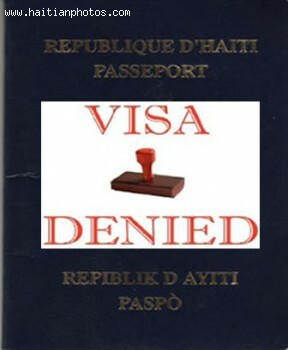 Regardless of the current problem of the delay and possible hike in the fee, the service of the passport system in Haiti has come a long way in regards to its policies and practices, considering the passport racket decades before, in which the government was complicit in the sale of Haitian passports across Europe for as much as $3,000 each.